In 2013-14 Polish UFO researchers received numerous reports about unidentified aerial devices in form of triangles and boomerangs. Being silent, often camouflaged and active only at night, those objects were breaking basic safety rules and posing potential danger to citizens. Numerous anomalous elements mentioned by witnesses are paired with fact that most sightings took place in vicinity of large military installations. That arise question whether we deal with something of human origin, connected with civil war on Ukraine or the new face of UFO phenomenon. Increased activity of triangular/boomerang-shaped UFOs in Poland began in the spring 2013 although occasional sightings of the same characteristics took place in earlier years. A debate about origins of those objects was born amongst Polish UFO researchers. Unfortunately mainstream TV, press and officials (both civil and military) keep silent despite fact that many incidents took place in close vicinity of military installations and some witnesses were of army background. In the course of sightings analyses two main hypotheses appeared. They were partially based on works on famous Belgian UFO wave as well as NIDS reports about the triangular/boomerang-shaped unidentified flying objects. First hypothesis assume that those objects are secret American aircrafts tested or operating over Poland (it’s rather impossible that such sophisticated machines would be constructed and deployed by Polish Army). The idea is backed by fact that some earlier US covert operations, involving amongst other secret CIA prisons, were conduced on Polish territory. Moreover, the recent tensions in Ukraine (bordering Poland to the east) and increasing number of US Army corps in Poland suggest that those crafts may be of military origin (though it must be remembered that the wave began circa half-a-year before the conflict). Second hypothesis focuses on anomalous features of mentioned objects and their strange appearance which makes them similar in nature to UFO objects. Triangles/boomerangs manifest themselves in various forms (in fact each one is different) and display flight characteristics unlike any conventional crafts (involving extraordinary maneuvers, acceleration and lack of sound). Some were reported to deploy a kind of "flawed masking" - in effect more attention-catching than camouflaging. But the most important and worrying aspect is that with elusive, uncontrollable, nocturnal activity those objects, appearing mostly over inhabited areas, pose possible danger. The following summary lists the most interesting sightings of triangular/boomerang-shaped UFOs from period 2013-2014 and includes also four earlier cases worth of attention. They were reported to: Piotr Cielebias and Michał Kusnierz, Arkadiusz Miazga, Damian Trela, Arkadiusz Kocik and Bogdan Zabielski. The summary was compiled from reports and witness accounts published or archived by mentioned researchers. • Wikłow area, (lodzkie), September 16th 2010, 22:30: Michal D. and his fiancée were driving a highway from Czestochowa to Radomsko. Despite nighttime, the road was trafficked. 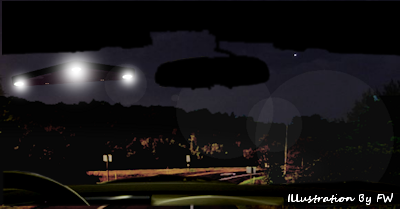 Suddenly a dark triangular object about 30 ft wide appeared over the road remaining at altitude of about 450 ft. First glances ensured the witness that the object was "disabled": "From behind a small elevation a black triangle appeared having lights in the corners. At first I took it for a landing plane but there’s no airfield in the area. It was moving really slowly. Two of the lights were steady but one blinked as if ‘broken’. When I passed under the object (it was hovering over the road so it became inevitable), I had an opportunity to look at its ‘propulsion system’ and structure. It wasn’t smooth at all but covered with ‘appendages’ (dice-like amongst others) protruding from its underside" - Michał D. reported. In his opinion the craft "propulsion system" was composed of three round nozzles that emitted out a "curved light or flame" (illuminating the craft from below). In the meantime the witness woke up his fiancée informing her about the phenomenon. As he noticed, other drivers were slowing their cars to admire the odd manifestation. One other independent witness confirmed the event. (Reported to: Arkadiusz Miazga, Piotr Cielebias, Michal Kusnierz). • Poznan, Lazarz district (wielkopolskie), February 14th, 6 pm: The following case is disputable although include a photo of possible triangular object taken from the distance. The man claims to see a gray-dark, triangular object hovering low over neighboring housing estate: "At first I take it for illusion of some kind. It was at dusk. The weather was good with cirrus clouds at high altitude. The region of the sky with triangle was clear" - he admitted. The witness took two photos showing blurry object. He claims that then the triangle moved in his direction and when it departed, two F16 from Krzesiny AFB appeared. (Reported to: Piotr Cielebias, Michal Kusnierz). • Biala (dolnoslaskie), April 2013, evening: A young man performing domestic duties went outside seeing a formation of three lights rising up from behind nearby trees. "That thing rose up at dozen of meters in the air and stopped. After a while the object began to change its position and then I could clearly see that it was in a form of isosceles triangle" - the said. The witness called his wife who also saw the lights departing toward Chojnow. (Reported to: Damian Trela). • Elizowka (lubelskie), August 14th 2013: Very intriguing report came from Mr. Karol - an amateur astronomer who in lengthy e-mail reported seeing a triangular object unlike other mentioned ones. The "craft" probably was heading into higher parts of the atmosphere and was observed with telescope: "The top of that triangle was oriented up […]. I saw some other details while watching the object gaining altitude. It was in shape of isosceles triangle which color and ‘oscillations’ looked like flames. The object was crimson red and there was a symmetrically set, golden isosceles triangle inscribed into it. Both didn’t change positions during the sightings so I assumed it must be a single object or two firmly joined together" - he added. (Reported to: Piotr Cielebias, Michał Kusnierz). • Goldap (warminsko-mazurskie), April 26th 2013, 1:30 am: The witness - introducing himself as military officer, said he accidentally perceived a strange "craft" passing over cirrus levels in Goldap. The object resembled the letter "V" with a blunt end, moving with the opened part ahead. On the object hull were positioned some lamps changing colors from light-green and blue to yellow and violet. The man was shocked with the object size and possibility that "such amazing thing is cruising across Polish skies". The soundless object remained in his sight for about 150 seconds. It’s worth to note that the region where the sighting took place, located by Russian border, is known from sightings of unusually shaped crafts in previous years, with another triangle seen in 2003 in Bartoszyce. (Reported to: Bogdan Zabielski). • Szczecin (zachodniopomorskie), middle of May, ~ 11 pm: "Wrapped in blankets, we were observing the sky hoping to see meteorites. We sat in the middle of the garden and stared in north-western sky and that was the direction the object was heading to. It was soundless and passed over us. [...] It looked as if ‘plasmatic’. Its frontal part seemed sharp and there were some ‘shadows’ of circular points on the sides that we took for lamps of some kind. I was stunned with that sight and so was my daughter. After a while two military jets followed. [...] Basing on visual estimations, it was about three times bigger than them. The object seemed transparent and only its contours appeared as if illuminated by some unknown source of light" - said the female witness. (Reported to: Arkadiusz Miazga). • Grudziadz (kujawsko-pomorskie), August 3rd 2014, 2 am: "I woke up and went to the balcony to get some cooling. After a while I saw a moving satellite, then another two - small points of light moving across the sky" - wrote the witness who at about 2 am saw unusual thing - large, dark, triangular object followed strapped to another, plate-like UFO. "It was 2000-2500 ft in the air. I saw it for circa two seconds. It was two times bigger than ultra-light planes often taking off from the local airfield but 3-4 times quicker. It came soundlessly" - the observer added. It’s worth to mention that nearly identical sighting took two days earlier in Zory (slaskie) but the report is less detailed. (Reported to: Arkadiusz Miazga). • Legnica (dolnoslaske), August 6th 2014, 11 pm: "My mum went to the balcony to watch falling stars. After a while she said to me that she saw a brilliant object […] and then noticed huge ‘shadow’ similar in shape to bird silhouette. She saw in the sky a triangular object made of tiny amber-colored (or reddish), non-blinking lights. […] It was bigger than an airplane and was very high in the sky. After a while the thing shot with tremendous speed, overtook one of the falling stars and disappeared. It all lasted just some seconds" - the witness reported. The mentioned object was similar to an arrowhead and got an additional ‘line’ between two outer arms. • Piekary Slaskie, Brzozowice district (slaskie), September 20th 2014, ~8 pm: Mrs. G. who went to light out a cigarette during family meeting, noticed very strange object nearly just above her: "Suddenly I saw a passing plane but one that was strangely illuminated. I thought that it would take down in Pyrzowice but the alleged plane was approaching me in total silence. […] It came just over me. It was a big triangle. It soon flew away but after a while… stopped, came back and hovered above. At first I began to laugh […] and after some time it came to me that it must be something highly unusual. I run for my daughter but upon returning, the craft was gone" - she reported adding that the object was as big as "two passenger airplanes" and possessed deep red lights along its perimeter. There was also a "pillar of light" coming from its underside. (Reported to: Piotr Cielebias and Michał Kusnierz). There were also other sightings, some made from distance and other very short but perplexing. Such a sighting took place on September 9th 2013 in Sokolka where two men standing on balcony saw only seconds-long pass of flying triangle dotted with lights. Other reports involved objects of unusual shapes but comparable to planes (one such a thing was seen just on September 25th 2014, in Lublin, not so far from Ukrainian border; the object in size of F16 - according to the witness, traveled just 300 ft over the ground but at some point departed with enormous speed). The real scale of triangle/boomerang UFOs sightings remains unknown because the matter is not covered in mainstream media and probably only some witnesses decide to report their sightings. Triangular/boomerang UFO sightings raise several serious problems including: origin of those objects, their connection to military installations, their anomalous behaviors and possible danger posed to citizens due to safety rules transgressions. Already nonexistent NIDS research group (led by dr. Kelleher) tried to solve part of those problems putting forward some hypotheses. One suggested that flying triangles/boomerangs form a new, special family of secret military devices (perhaps advanced blimps) used for transportation. But the great diversity amongst objects and somewhat reckless tactics of their operators, made that hypothesis flawed. Conclusions of NIDS reports about exotic aerial machines are comparable with our observations: those objects are both elusive and manifestation prone; surely they aren’t prototypes and from unknown reasons they tend to appear over inhabited areas. In other words, despite their quasi-familiar technological form, they remain highly anomalous. Despite of those facts, one still can find some arguments for boomerang/triangles military origins. Amongst the mentioned sightings, many took place in vicinities of military bases (Sandomierz, Poznan, Hrubieszow, Lubliniec, Grudziadz). The current situation in Ukraine may prompt some NATO decisions connected with relocation some of top secret flying machines used in both transportation and surveillance to Poland. The weak point of those allegations and connections with Ukraine is that exotic crafts were seen mostly in western and central parts of the country and (most importantly) that we find no recognizable "types" or tactics amongst objects. Assessing the mentioned reports from military-technological perspective one would be also shocked by the total lack of care by those who operate the machines literally just over the people’s heads. Providing that military possess such a superb technology, it’s hard to believe that they would risk and fly over city centers and housing estates. Proponents of the mentioned hypothesis should also ask themselves, what would be the consequences if one of objects crash-landed somewhere in Lubliniec, Wiklow or Pabianice. Anomalous behaviors are clearly seen in the mentioned cases. They include: craft shapes unusual or useless in aeronautics, lack of sound generated by engines, extraordinary acceleration rate, strange disappearances and other aspects noted in classical UFO report. Therefore it may be not so wrong to suppose that triangle/boomerangs form a branch of complex UFO phenomenon in Jacques Vallée’s interpretation assuming that it’s rather a mental process than a material phenomenon and it’s able to evolution. Flying triangles could be the next "stage" of UFOs after epoch of flying saucers. The whole process is driven by mysterious "metaintelgence" of which one can learn from dr Vallée works. Without help and comments from military and other official sources, it would be hard to determine the exact nature of the phenomenon. Polish Army and government officially don’t comment UFO-related events and since accession of Poland to NATO, the topic is nearly "stigmatized" in mainstream TV and press. The best example of how Polish citizens perceive Army politics is that most (if not all) won’t contact military or Police in case of UFO sighting fearing that they would be ridiculed or ignored. The standards are exactly opposite as in Belgium where a rash of triangular UFOs evoked serious reaction from state and military officials. Visit the authors' web-site . . .